X Comparative Microbial Genomics and Taxonomy: Frontiers in Marine Biotechnology. 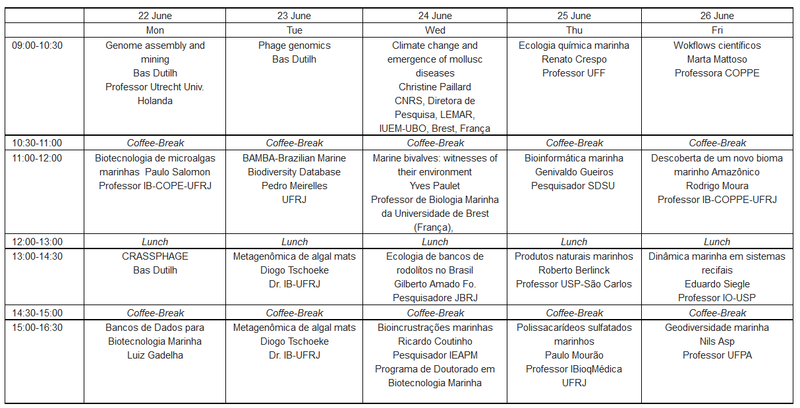 Preliminary Schedule:Frontiers in Marine Biotechnology. We aim to discuss the most recent topics on Marine Sciences and Biotechnology, including the intersections in biodiversity, biogeochemistry, mariculture, natural products, genomics, and bioinformatics.Targets graduate students and researchers from different Brazilian institutions. Lectures in English and in Portuguese. Application deadline 19 June 2015.